Hanging is the suspension of a person by a noose or ligature around the neck. The Oxford English Dictionary states that hanging in this sense is "specifically to put to death by suspension by the neck", though it formerly also referred to crucifixion and death by impalement in which the body would remain "hanging". Hanging has been a common method of capital punishment since medieval times, and is the official execution method in numerous countries and regions. The first account of execution by hanging was in Homer's Odyssey. In this specialised meaning of the common word hang, the past and past participle is hanged instead of hung. There are four ways of performing a judicial hanging: suspension hanging, the short drop, the standard drop, and the long drop. A mechanised form of hanging, the upright jerker, was also experimented with in the 18th century, with a variant of it used today in Iran. Suspension, like the short drop, causes death by using the weight of the body to tighten the noose around the trachea and neck structure. Prisoners are reported to have little or no struggle before they go limp because their jugular vein and carotid arteries are blocked and blood flow to the brain is reduced. The person slowly dies of strangulation, which typically takes between ten and twenty minutes, resulting in a considerably more elongated and painful death as compared to the standard or long drop hanging. "If the airway is constricted, and full suspension achieved (feet fully off the floor), this method, at least initially, is likely to be very painful, as the person struggles for air against the compression of the noose and against the weight of their own body, being supported entirely by the neck and jaw." The short drop is performed by placing the condemned prisoner on the back of a cart, horse, or other vehicle, with the noose around the neck. The object is then moved away, leaving the person dangling from the rope. A ladder was also commonly used with the condemned being forced to ascend, after which the noose was tied and the ladder pulled away or turned, leaving the condemned hanging. Another method involves using a stool, which the condemned is required to stand on, being kicked away. The guards at the Stutthof concentration camp who were sentenced to death were executed by short-drop hanging; they were placed in the noose while standing or sitting on a truck, and the trucks were driven away. As with suspension hanging, the condemned prisoner slowly dies of strangulation, which typically takes between ten and twenty minutes, resulting in a considerably more prolonged and painful death as compared to the standard or long drop hanging, which is intended to kill by using the shock of the drop to fracture the spinal column at the neck. Before 1850, the short drop was the standard method for hanging, and is still common in suicides and extrajudicial hangings (such as lynchings and summary executions) which do not benefit from the specialised equipment and drop-length calculation tables used by the newer methods. This method was later also adopted by the successor states, most notably by Czechoslovakia; where the "pole" method was used as the single type of execution from 1918 until the abolition of the capital punishment in 1990. Nazi war criminal Karl Hermann Frank, executed in 1946 in Prague, was among cca 1000 condemned people executed in this manner in Czechoslovakia. The standard drop, which arrived as calculated in English units, involves a drop of between 4 and 6 feet (1.2 and 1.8 m) and came into use from 1866, when the scientific details were published by an Irish doctor, Samuel Haughton. Its use rapidly spread to English-speaking countries and those where judicial systems had an English origin. It was considered a humane improvement on the short drop because it was intended to be enough to break the person's neck, causing immediate paralysis and immobilisation (and probable immediate unconsciousness). This method was used to execute condemned Nazis under United States jurisdiction after the Nuremberg Trials including Joachim von Ribbentrop and Ernst Kaltenbrunner. In the execution of Ribbentrop, historian Giles MacDonogh records that: "The hangman botched the execution and the rope throttled the former foreign minister for twenty minutes before he expired." A Life magazine report on the execution merely says: "The trap fell open and with a sound midway between a rumble and a crash, Ribbentrop disappeared. The rope quivered for a time, then stood tautly straight." Nazis executed under British jurisdiction, including Josef Kramer, Fritz Klein, Irma Grese and Elisabeth Volkenrath, were hanged by Albert Pierrepoint using the variable drop method devised by Marwood. The record speed for a British long drop hanging was 7 seconds from the executioner entering the cell to the drop. Speed was considered to be important in the British system as it reduced the victims' mental distress. Those who survive a suicide-via-hanging attempt, whether due to breakage of the cord or ligature point, or being discovered and cut down, face a range of serious injuries, including cerebral anoxia—which can lead to permanent brain damage, laryngeal fracture, cervical spine fracture—which may cause paralysis, tracheal fracture, pharyngeal laceration, and carotid artery injury. There are some suggestions that the Vikings practised hanging as human sacrifices to Odin, to honour Odin's own sacrifice of hanging himself from the Yggdrasil. In Northern Europe, it is widely speculated that the Iron Age bog bodies, many who show signs of having been hanged were examples of human sacrifice to the gods. Just as I was crossing to the lever, he jumped with bound feet. The drop opened, and he plunged down, and I saw with horror that the noose was slipping. It would have come right over his head had it not caught roughly at a point halfway up the hood – it had in fact been stopped on his upper lip by the projection of his nose – and the body jerked down, then became absolutely still apart from the swinging of the rope. I went down into the pit with the prison medical officer. He examined the body and said to me: "A clean death. Instantaneous." He sounded surprised, and I did not blame him. I was surprised myself, and very relieved. On my next visit to Wandsworth the governor told me that the severance of the spinal cord had been perfect. Not surprisingly in retrospect, it appears that such unconventional application of forces might be particularly efficient. There is at least some evidence that some of the countries with particularly active programmes of judicial execution may have given the question of the design of efficient and reliable nooses practical attention. For example, photographs of nooses in a South African execution chamber opened to the public after abolition of the death penalty showed double nooses. Presumably the upper noose held the lower one in place to ensure a perfect hangman's fracture. Another process that has been suggested is carotid sinus reflex death. By this theory, the mechanical stimulation of the carotid sinus in the neck brings on terminal cardiac arrest. Although Israel has provisions in its criminal law to use the death penalty for extraordinary crimes, it has only been used once. On 31 May 1962, Nazi leader Adolf Eichmann was executed by hanging. Meir Tobianski was summarily executed for espionage during the Israeli War of Independence, but he was later exonerated. On 27 February 2004, the mastermind of the Sarin gas attack on the Tokyo subway, Shoko Asahara, was found guilty and sentenced to death by hanging. On 25 December 2006, serial killer Hiroaki Hidaka and three others were hanged in Japan. Hanging is the common method of execution in capital punishment cases in Japan, as in the cases of Norio Nagayama, Mamoru Takuma, and Tsutomu Miyazaki. Death by hanging is the traditional method of capital punishment in Jordan. In 1993, Jordan hanged two Jordanians convicted of spying for Israel. Sajida al-Rishawi, "The 4th bomber" of the 2005 Amman bombings, was executed alongside Ziad al-Karbouly on 4 February 2015 by hanging in retribution to the immolation of Jordanian Pilot Muath Al-Kasasbeh. The last person executed by hanging in Portugal was Francisco Matos Lobos on 16 April 1842. Before, it had been a common death penalty. At the beginning of the 19th century, children in Britain were punished in the same way as adults. They were even sentenced to death for petty theft. Until 1868 hangings were performed in public. In London, the traditional site was at Tyburn, a settlement west of the City on the main road to Oxford, which was used on eight hanging days a year, though before 1865, executions had been transferred to the street outside Newgate Prison, Old Bailey, now the site of the Central Criminal Court. In 1957, in an attempt to prevent the abolition of capital punishment completely, two levels of murder were defined: First Degree murder and Second Degree with only First Degree murder carrying the death penalty. Balvenie Pillar, also known as Tom na Croiche (Hangman's Knoll). The pillar was erected in 1755 to commemorate "the last public hanging", in Scotland in 1630. In this case the definition of "last" is unclear as the last public hanging in Scotland is well documented as being held in Dumfries in 1868 (Robert Smith). Capital punishment varies from state to state; it is outlawed in some states but used in most others. However, the death penalty under federal law is applicable in every state. The largest mass execution in the United States, of 38 Sioux Indians sentenced to death for engaging in massacres of white settlers, was carried out by hanging in Mankato, Minnesota in 1862. A total of 40 suspected Unionists were hanged in Gainesville, Texas in October 1862. On 7 July 1865, four people involved in the assassination of President Abraham Lincoln—Mary Surratt, Lewis Powell, David Herold, and George Atzerodt—were hanged at Fort McNair in Washington, D.C.
Only the states of Washington and New Hampshire retain hanging as an option. In New Hampshire, if it is found to be "impractical" to carry out the execution by lethal injection, then the condemned is hanged, and in Washington the condemned still has an outright choice between hanging and lethal injection. The United States also has an extensive history of extrajudicial hangings, known as lynching. This was especially common during the Jim Crow era. In Spain 1449, during a mob attack against the Marranos (Jews nominally converted to Christianity), the Jews resisted, but lost and several of them were hanged up by the feet. The first attested German case for a Jew being hanged by the feet is from 1296, in present-day Soultzmatt. Some other historical examples of this type of hanging within the German context are 1 Jew in Hennegau 1326, two Jews hanged in Frankfurt 1444, 1 in Halle in 1462, 1 in Dortmund 1486, 1 in Hanau 1499, 1 in Breslau 1505, 1 in Württemberg 1553, 1 in Bergen 1588, 1 in Öttingen 1611, 1 in Frankfurt 1615 and again in 1661, and 1 condemned to this punishment in Prussia in 1637. The details of the cases vary widely: In the 1444 Frankfurt cases and the 1499 Hanau case, the dogs were dead prior to be hanged, and in the late 1615 and 1661 cases in Frankfurt, the Jews (and dogs) were merely kept in this torture for half an hour, before being garroted from below. In the 1588 Bergen case, all three victims were left hanging till they were dead, ranging from 6 to 8 days after being hung up. In the Dortmund 1486 case, the dogs bit the Jew to death while hanging. In the 1611 Öttingen case, the Jew "Jacob the Tall" thought to blow up the "Deutsche Ordenhaus" with gunpowder after having burgled it. He was strung up between two dogs, and a large fire was made close to him, and he expired after half an hour under this torture. In the 1553 Württemberg case, the Jew chose to convert to Christianity after hanging like this for 24 hours; he was then given the mercy to be hanged in the ordinary manner, from the neck, and without the dogs beside him. In the 1462 Halle case, the Jew Abraham also converted after 24 hours hanging upside down, and a priest went up on a ladder and baptised him. For two more days, Abraham was left hanging, while the priest argued with the city council that a true Christian should not be punished in this way. On the third day, Abraham was granted a reprieve, and was taken down, but died 20 days later in the local hospital having meanwhile suffered in extreme pain. In the 1637 case, where the Jew had murdered a Christian jeweller, the appeal to the empress was successful, and out of mercy, the Jew was condemned to be merely pinched with glowing pincers, have hot lead dripped into his wounds, and then be broken alive on the wheel. Some of the reported cases may be myths, or wandering stories. The 1326 Hennegau case, for example, deviates from the others in that the Jew was not a thief, but was suspected (even though he was a convert to Christianity) of having struck an al fresco painting of Virgin Mary, so that blood had begun to seep down the wall from the painting. Even under all degrees of judicial torture, the Jew denied performing this sacrilegious act, and was therefore exonerated. Then a brawny smith demanded from him a trial by combat, because, supposedly, in a dream the Virgin herself had besought the smith to do so. The court accepted the smith's challenge, he easily won the combat against the Jew, who was duly hanged up by the feet between two dogs. To add to the injury, one let him be slowly roasted as well as hung there. This is a very similar story to one told in France, in which a young Jew threw a lance at the head of a statue of the Virgin, so that blood spurted out of it. There was inadequate evidence for a normal trial, but a frail old man asked for trial by combat, and bested the young Jew. The Jew confessed his crime, and was hung up by his feet between two mastiffs. In 1713, Juraj Jánošík, a legendary Slovak outlaw and folk hero, was sentenced to be hanged from his left rib. He was left to slowly die. The German physician Gottlob Schober (1670-1739), who worked in Russia from 1712, notes that a person could hang from the ribs for about three days prior to expiring, his primary pain being that of extreme thirst. He thought this degree of insensitivity was something peculiar to the Russian mentality. ↑ Oxford English Dictionary, 2nd ed. Hanging as method of execution is unknown, as method of suicide from 1325. ↑ Report by Kingsbury Smith, International News Service, 16 October 1946. ↑ "Gruesome death in gas chamber pushes Arizona towards injections", New York Times, 25 April 1992 (retrieved 7 January 2008). ↑ Suicide Statistics accessed on 16 May 2006. ↑ 28.0 28.1 28.2 28.3 Capital Punishment Worldwide, MSN Encarta. Archived 31 October 2009. ↑ Richard Solash, Hungary: U.S. President To Honor 1956 Uprising (20 June 2006), radio Free Europe; RadioLiberty. ↑ IRAN: Halted execution highlights inherent cruelty of death penalty. Amnesty International USA (9 December 2008). Retrieved on 2008-12-11. ↑ AP: Saddam's half brother and ex-official hanged 15 January 2007. ↑ Top Saddam aide sentenced to hang 12 February 2007. 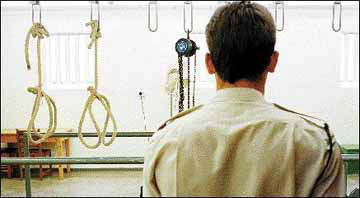 ↑ Saddam's former deputy hanged in Iraq 20 March 2007. ↑ Iraq's "Chemical Ali" sentenced to death, MSNBC.com, 24 June 2007. Retrieved on 24 June 2007. ↑ Second death sentence for Iraq's 'Chemical Ali, MSNBC.com, 2 December 2008. Retrieved on 2 December 2008. ↑ Iraq's 'Chemical Ali' gets 3rd death sentence, Associated Press, 2 March 2009. Retrieved on 17 January 2010. ↑ 'Chemical Ali' gets a new death sentence, MSNBC.com, 17 January 2010. Retrieved on 17 January 2010. ↑ "Hanging". The 11th Edition of the Encyclopædia Britannica. ↑ "National Affairs: CAPITAL PUNISHMENT: A FADING PRACTICE". Time. 21 March 1960. ↑ Writ of Execution – Laurence, Earl Ferrers. ↑ The Newgate Calendar – Laurence, Earl Ferrers. ↑ "Modern-day 'outlaws' gather to honour Jánošík". The Slovak Spectator. 9 July 2012. Jack Shuler, The Thirteenth Turn: A History of the Noose. New York: Public Affairs, 2014. Wikimedia Commons has media related to Hanging.